European Commission does not care about the future of the digital single market. This is basically what it just communicated to citizens of Europe in its recently leaked proposal on Directive on copyright in the Digital Single Market. Its content is nothing but a shameful statement of where a lobbying muscle of the music industry can drag our policy makers. Evidence does not matter; the public consultations are not worth the paper they are written on. 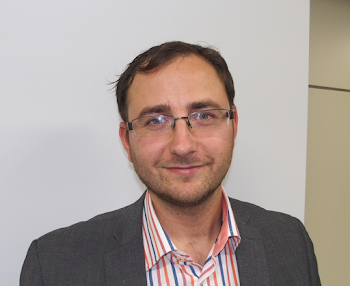 This brief piece will try to make sense of the newly proposed rules on intermediary liability. The proposal tries to address address the so called 'value gap' problem. Value gap is a rhetorical device borrowed from the music industry that mostly likely coined the term for the first time in its global music reports (before IFPI 2016 report, you see it really only in music industry documents). Its argument is that because the hosts such as YouTube are covered by a safe harbour and have to act only upon notice to remove content of its users, they get content via various voluntary revenue-monetizing agreements/systems like ContentID for less money than streaming services like Spotify. This then represents a gap between the added value to the service and income that it produces money to the right holders. To be sure, music industry complains about revenue-share that it gets based on agreements they agreed to in voluntary negotiations. They say that the hosting safe harbour causes imbalance in these negotiations because they cannot charge YouTube as Spotify because hosts can simply fall back on notice and take-down and not agree to anything. Yes, that is what happens if you provide a different type of service [selling music streaming with high quality content vs selling advertising on top of user-generated-content]. What music industry is really complaining about is that since they cannot perfectly enforce their rights against infringing users (or perhaps because it costs money), intermediaries should pay them for users, and the fee should be equal to what the highest paying sort of clients pay - those selling the music itself. This is not a place to expand on this debate too much, but let me just say one thing. If hosts see notice-and-takedown as a real alternative to negotiations with right holders, perhaps it indicates that the music is not so indispensable for the online service. Right holders can expose services without such agreements to more enforcement, and so if the music would be so crucial, notorious take-downs would destroy its business. 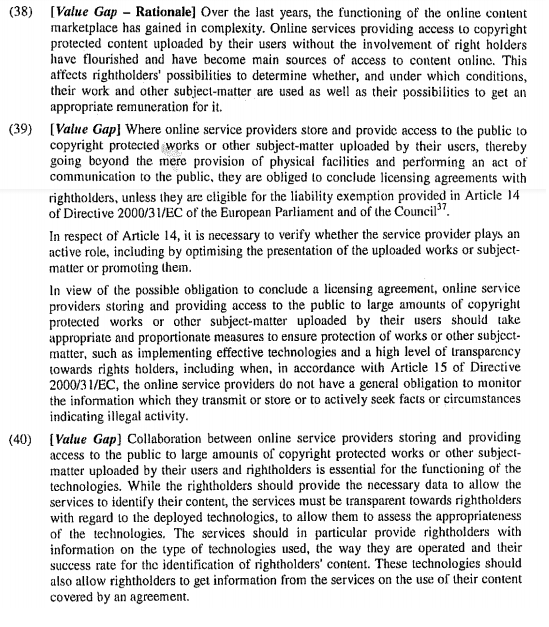 The Commission will maintain the existing intermediary liability regime while implementing a sectorial, problem-driven approach to regulation: (..) - in the next copyright package, to be adopted in the autumn of 2016, the Commission will aim to achieve a fairer allocation of value generated by the online distribution of copyright protected content by online platforms providing access to such content. Remember these words because the proposal change all existing intermediary liability principles in the field of copyright. In the draft of the proposal that was leaked yesterday on fantastic IPKat, the relevant provisions are recitals 38 to 40 and art. 13 (click for bigger picture). The proposal attacks the existing law already in Recital 39. Pretending that it summarizes some established principles, it says that hosts and other service providers who are not passive [don't provide technical infrastructure], are automatically ('thereby') communicating work to the public and thus have to license the content. If this was true than none of the courts in Member States would have to struggle with its own domestic secondary liability laws. Yes, because unlike the European Commission, most of the scholars, case-law and policy people think that if you assist in disseminating content, you might have that dissemination attributed to you under some circumstances (secondary liability), but don't pretend that dissemination is your own (direct liability). EC's attempt is what we have seen in 90's during the Bill Clinton administration and is exactly the reason why E-Commerce Directive or DMCA were enacted. Since the EC has to live with the E-Commerce Directive, because citizens clearly support it, it does a trick. First, it says that direct liability does not apply in case you are covered by a safe harbour, while immediately stressing its limited applicability. The proposal says that to assess neutrality, it is necessary to verify whether the hosting provider plays an active role, including that it optimizes or promotes user generated content (the language originates from the L'Oreal v eBay and was much criticized in the literature). Second, it imposes on some intermediaries (see below), including those intermediaries who remain to be covered by any safe harbour, an obligation to implement filters [aka stay-down]. It does so in art. 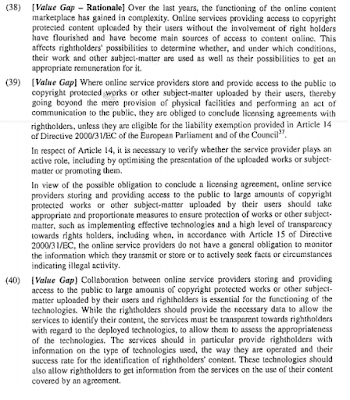 13 in two ways: (1) by stipulating that those with existing voluntary agreements "shall take appropriate and proportionate measures to ensure the functioning of the agreements" and (2) by imposing an obligation "to prevent the availability" of works not covered by such agreements, "including through the use of effective content identification technologies". 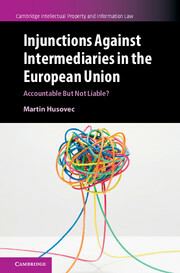 In addition, intermediaries are obliged to report to all right holders (sic!) what kind of measures they use and how much their works are used via their services and how successful their are with blocking. Right holders should provide their reference files - but there is no legal obligation to this end, since it is a small "should" appearing in the recital. When I say some intermediaries, I mean all "service providers that store or and provide to the public access to large amounts of works or other subject matter uploaded by their users". If you wondered, this does not only cover hosting providers, but easily also internet access providers or any other providers that are not even covered by any existing safe harbour. There is no explicit requirement that works are uploaded on their service, only that they store or provide access to large amounts of such works uploaded also by their users. Where they are uploaded, seems irrelevant. Update: I mistakenly copied "or" language in the previous version; the text actually reads "and", so this seems to refer to hosting more clearly; though it still omits to state storage on their services. Thanks for spotting Pekka! Art 13 can thus impose filtering and reporting obligation on unprecedented number of service providers. Far beyond "only" hosting providers. How exactly the European Commission imagines this to be compatible with Sabam and Scarlet Extended, is not clear to me. This is flatly and with a straight face proposing what those judgements rejected with pomp and human rights language. No sophistication. Period. What is also striking is that the proposal finally comes up with an obligation to implement counter-notice (art. 13(2)). However, with a major wrinkle. It only applies to filtering mechanisms, not to regular notice and take-down. But hey, who will care about regular notice-and-taken anymore, right? The last paragraph of art. 13 nicely shows the cynicism of the proposal. It asks the Member States to help with facilitation of best practices/standardization with regard to filtering technologies. Counter-notice standardization? Not important. The main point is that of filtering. We got the message! This proposal is deeply worrying. The European Commission clearly wants to challenge the E-Commerce Directive, just without really saying it. To summarize. First, its proposal tries to impose strict liability by extending right to communication to the public to anyone who is not providing mere infrastructure. And it does not even have balls courage to say in the actual text of the provisions, it just pretends so in the recitals. Second, it imposes a full-flagged filtering and reporting obligation on yet unknown number of service providers. Effectively, this proposal will petrify competition and raise barriers to entry to the digital single market. I guess I am too horrified to think of all the consequences yet. PS: this is, of course, super-preliminary assessment; comments are super-welcome! Thanks for clarification. This is really worrying, indeed. Looks like the whole proposal of the directive is a big disappointment. It´s very superficial on one hand and harmful on the other.